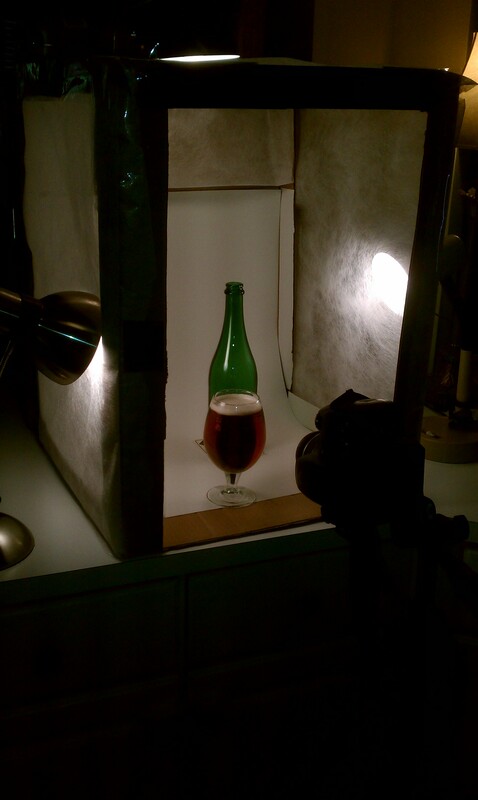 A few of you have emailed me asking what I shoot the sour beer pictures with. The equipment I use is pretty simple. I use a Sony Alpha-500 camera for the main photo shoots. For the shots that have an effect I usually use my HTC EVO and I use an app called Vignette that creates the effects. For the photo shoots I built a very inexpensive light box using the instructions here. There are three 60 watts desk lamps that surround the box for light. It works great for what I need to use it for. For those of you who want to get better shots of those hard to find beers or want to show off your home brew in the way you see it I would say build one. It’s very easy and improves your pictures. Below is a behind the scenes looks at the photo shoot today for an upcoming post. Oh one quick tip…use coasters so you don’t stain the white on the first day like I did!